We set goals, ambitious goals and striving to achieve those goals, particularly important ones, comes with feeling intense emotions. Often anxiety is seen as a negative feature and something to try to dampen. One of the issues with anxiety is that it can be associated with negative thoughts and a desire to withdraw and wishing to be somewhere else. These are the normal responses. We surveyed over 70,000 people in our BBC Lab UK study and found moderate anxiety was normal response for athletes who performed at their best; when we ask them to think about how they felt when they performed at their best they reported feeling moderately anxious. We might expect best performance to link to low anxiety and high anxiety to poor performance but this was not the case. Often anxiety is seen as a negative feature and something to try to dampen. And so when someone asks me to help with anxiety or emotions, key questions I ask is when do they experience intense feelings, and what effect does this anxiety have on thoughts and performance? If anxiety is high and makes you want to withdraw from the activity, do you ever act on this emotion? Or do you try to perform experiencing this emotion, and how does this emotional experience change as you start performing? There is an interplay between performance and anxiety, and that once performance starts, and the disaster that was running through your mind before starting does not happen, and performance resembles something similar to what you have done before, then the intensity of anxiety reduces. Pre-competition anxiety can feel unpleasant, and associates with negative thought but it does not necessarily have negative effects on performance as we do not act on these thoughts. The thought that says ‘you can’t do this’ that can accompany anxiety can trigger a mindset of ‘yes I can’ as you engage in a conversation with yourself on what path to follow. There is an interplay between performance and anxiety. The doubts our emotions sow in our minds can prompt action, extra effort to ensure that these doubts do not follow through and as such, lead to better performance. Many people learn to interpret high anxiety as a signal of ready to perform, and that best performance accompanies high anxiety. Such an idea is consistent with the evolutionary function of anxiety that it is a signal to help mobilise resource in the face of a fight or flight situation. Anxiety primes the individual for action, raises awareness of what is going on around them and also what is going on internally. This process of raising awareness can be functional. I encourage athletes to think about how they will feel at the start of competition, feel the nerves, listen to the negative thoughts, and capture that moment for it serves as a reminder to train hard in the interim period. Worry that performance will be poor in the future, the depression that is experienced from defeat can serve to motivate action in the present. People can experience anxiety when performing. We have studied this in detail in endurance sports and anxiety can influence how physiological sensations of fatigue are reported. In endurance sports, however, anxiety can serve debilitating effects as the person is most worried about fatigue in the later stages of competition. In these activities, anxiety can intensify feeling fatigue. In a study where we intentionally sought to increase negative emotions, and achieved this by giving false performance feedback, telling athletes that they were going slower than they expected, we found that the behavioural response was to increase effort. By trying harder, this brought spikes in physiological responses such as increased breathing rate and volume. The doubts our emotions sow in our minds can prompt action. The result was that when the athlete felt anxious, the same intensity of performance felt harder; that is, when the athlete rode at, say, 20 mph in control conditions it felt easier than riding the same speed of 20 mph when anxious, prompting the idea that anxiety eats away into the headroom for better performance. Our approach has been to help manage emotions within competition and do this via setting process goal. A process goal is where attention or concentration is focused on the task at hand. 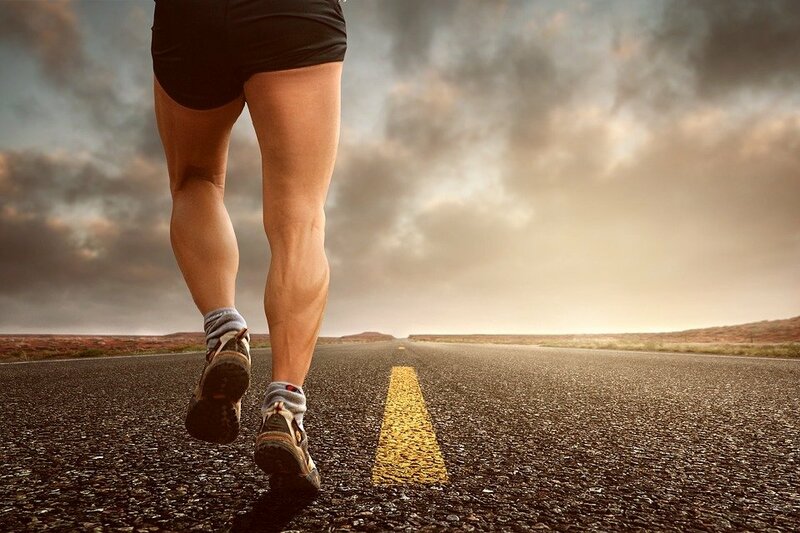 In running we encourage people to find a rhythm and focus on smooth action and to concentrate all thoughts on performing smoothly and efficiently. This translates into focusing on performance enhancing coaching tips such as ‘run tall’ or ‘high hips’, or to enact a rhythm by counting to yourself. We have also done this with cycling and in cycling we encourage people to focus on riding with a smooth action, typically using steam train wheels as imagery. Focus on the process, on what you need to do to achieve the goal. By focusing on process goals, the person switches attention from what the likely outcome could and all the emotions that come with that to the specific requirements of doing the task. The argument is that if all attention is focused on what you are doing, and if that attention is intense, and you possess sufficient skills and physical capabilities then you increase the likelihood of achieving the outcome goal. But, the outcome goal is not in the front of your mind, but a distance thought in the back of your mind that will cause intense emotions if you think about it, and the arousal that comes with that thought can be functional at times – such as not concentrating, or daydreaming. Anxiety is a normal response to trying to achieve an important goal. If the goal is important, you will experience anxiety and it’s better to accept that as a normal part of performance and recognise its signal than trying to reduce it. Focus on the process, on what you need to do to achieve the goal. Develop strategies to help produce a process-focused mindset and if you can do this, your chance of achieving the goal increases. Andy Lane is a Professor of Sport Psychology at the University of Wolverhampton. He is a fellow of the British Association of Sport and Exercise Sciences (BASES), and Chartered Sport and Exercise Scientist. He is Health Professional Council registered and a British Psychological Society Chartered Psychologist. He speaks regularly to the media on running, speaking on podcasts such as Marathon Talk and was listed as one of the most influential experts in running by Runners World. He is a competitive runner and completed a sub 3-hour marathon at London in 2015.